Prop 29: Should Smoking in California Be More Expensive? That's the underlying question that Proposition 29 poses to California voters, who go to the polls in June to decide if smokers should pay an extra buck in taxes for a pack of cigarettes. What would Prop 29 do? If passed, the measure - called the California Cancer Research Act - would add an additional dollar to a pack of cigs and other tobacco products sold in California (amounting to five more cents/cigarette). It would more than double the current tobacco tax rate - the most dramatic increase in the state's history. The estimated $735 million (annually) in new revenue (adjusted for tax revenue lost from the projected decrease in sales) would go toward a special fund administered by an appointed committee to support research on cancer and other tobacco-related diseases, as well as prevention and enforcement initiatives. None of it would be used for medical treatment. If the measure passes, tobacco sales in California are predicted to decrease by as much as $1 billion a year. If the measure does NOT pass, the current cigarette tax of 87 cents would remain as is. Californians for a Cure is the group behind Prop 29. Co-chaired by former State Senate Pro Tem Don Perata and cycling legend Lance Armstrong, both cancer survivors, the group consists of a host of large health foundations, namely the American Cancer Society, the American Lung Association and the American Heart Association. The campaign argues that the new tax will save lives in California by significantly reducing smoking rates, especially among youth, and by funding cancer research. As of mid-May, it had raised about $8.5 million. Californians Against Out-of-Control Taxes and Spending is the campaign trying to defeat Prop 29. Supported by a number of anti-tax groups, it is funded primarily by major tobacco companies to the tune of nearly $40 million (as of mid-May). The campaign, it's worth noting, is not trying to argue that cigarettes aren't bad for you or that there shouldn't be government prevention programs and cancer research efforts. Rather, it argues that the measure is fundamentally flawed - especially in the midst of the state's budget crisis - because it doesn't guarantee the additional revenue would stay in California, and creates a wasteful, unnecessary and unaccountable government bureaucracy. The campaign to defeat the measure, and the strategy of spending millions on a statewide advertising blitz against it, seems to be effective. Since March, the measure's approval rating among likely voters has dropped 14 points, according to a new statewide survey conducted by the nonpartisan Public Policy Institute of California. As of late-May, 53 percent say they will vote yes, 42 percent say they will vote no, and 5 percent are undecided, the survey found. But back in March, before active campaigning around the measure began—67 percent supported it, 30 percent opposed it, and 3 percent were undecided. Interestingly, though, when likely voters were asked the more general question about increasing taxes on cigarette purchases, 63 percent still said they were in favor and 33 percent were opposed. Responses to this question were similar in March (63% favor, 34% oppose). “The large drop in support for Proposition 29 speaks loudly about how a well-funded opposition is able to raise voters’ doubts and distrust in state government, even when a tax increase is viewed favorably,” says Mark Baldassare, PPIC president and CEO. How does California's tobacco tax compare to rates in other states? California's current cigarette excise tax (an excise, by the way, means a tax levied on specific commodities) is pretty low compared to most other states (18th lowest, to be precise): right now the tax here is 87 cents/pack, almost 60 cents lower than the national average and a whopping $3.50 less than in New York, whose tobacco tax is $4.35, the nation's highest. (New York City has an additional $1.50 tax, so an average pack of smokes there costs more than $11!). 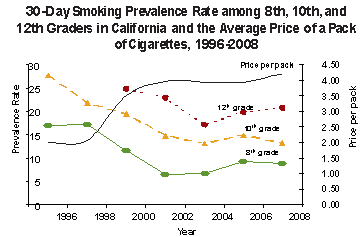 Taxes on tobacco products in California haven't increased in 14 years. We join Missouri and North Dakota as the only three states in the country that haven't increased them since 2000. Smokers throughout the U.S. also pay a federal excise tax of about $1/pack on top of state taxes. How does California's smoking rate measure up to other states? Despite its low taxes, California actually has the second lowest smoking rate in the country: just over 12 percent of adults. Compare that to the national rate of nearly 20 percent or one in five (the smoking rate among California's youth is slightly higher than it is among adults, but still far below the national average). The state's adult smoking rate has declined consistently over the last two decades, sparing more than 1 million lives and $86 billion, according to state health officials. In 2010, California's smoking rate reached a record low of 11.9 percent (it's risen slightly since), down from almost 26 percent in 1984. The most significant decrease occurred among adults ages 25 to 44. But while California's current smoking rate is significantly lower than many other parts of the country, there still are roughly 4.5 million adult smokers statewide. Click on any state to see the percentage of adult smokers (2010 data) and the tobacco tax rate. The darker the shade of red, the higher the smoking rate. Why is California's smoking rate so low? There's obviously no single answer, but a number of policy measures have received a lot of credit. 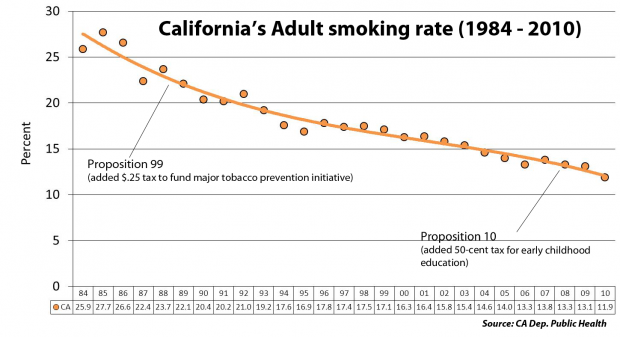 California has long been a trendsetter in local and state government smoking reduction efforts. In 1995 it placed a statewide ban on smoking in restaurants and workplaces, the first state to do so. Three years later, the ban was extended to bars. California has also spearheaded significant smoking prevention and education efforts, particularly geared towards youth. 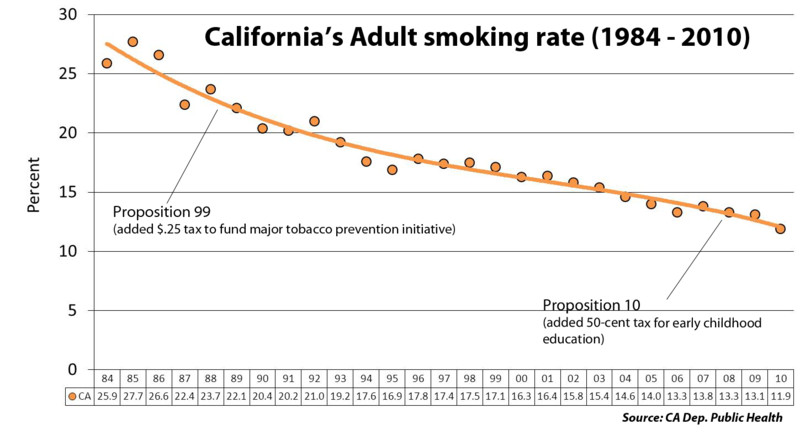 A 25-cent cigarette tax in 1998 created the California Tobacco Control Program, the first of its kind in the nation, charged with leading aggressive anti-smoking campaigns. What's the history of tobacco taxes in California? 1959: the state's first tobacco tax was passed by the legislature. It added 10 cents to the cost of a pack of cigarettes. The revenue went straight into the General Fund. 1988: voters approved Prop 99, which added an additional 25-cent tax to fund tobacco prevention, education, and research programs. 1993: a 2-cent tax enacted by the legislature created a fund for breast cancer research. 1998: voters approved Prop 10, adding a 50-cent tax to fund early child development programs. Last year, total state revenues from taxes on tobacco products were just over $900 million. California's last tobacco tax measure - Proposition 86 - appeared on the ballot in 2006, but was narrowly defeated. The opposing campaign spent nearly $67 million. The measure would have imposed an additional $2.60 per pack, giving California one of the highest tobacco tax rates in the country. Does raising taxes on tobacco products actually reduce smoking? Yes, according to the Centers for Disease Control and Prevention. "Increasing the price of cigarettes is one of the most reliable and effective ways to reduce smoking and prevent youth initiation," the agency reported in it Morbidity and Mortality Weekly Report on March 29, 2012. The report added: "The evidence indicates that further increases in cigarette excise taxes would continue to reduce the demand for cigarettes, thereby preventing youth initiation, reducing cigarette consumption, and decreasing the prevalence of smoking, particularly among youth and young adults. States can reduce cigarette use even further by investing excise tax revenue in tobacco prevention and control." Some economists, however, argue that high cigarette taxes can do more harm than good, drawing smokers to buy cigarettes in nearby states with significantly lower taxes and resulting in lost tax revenue for California. High costs, it's been noted, could also encourage a black market in cigarette sales, as has become common practice in New York City. What are the economic and social costs of smoking in California? Even with California's relatively low smoking rate, the economic and social costs here are still pretty steep. In 2004 (when the adult smoking rate was14.6 percent), roughly 35 thousand deaths in California among adults aged 35 and older were attributed to smoking, according to the California Department of Public Health. That's eight times the number of deaths from all infectious diseases combined. The department estimates that the total adult health-related cost of smoking that same year was more than $18 billion. That includes $9.6 billion in direct health care costs associated with smoking and $8.5 billion in productivity losses dues to smoking-attributed early death or illness. The department estimates that if smokers were to pay for these related costs, a pack of cigarettes would need to be increased by $9.70.